Lila Belle’s opinion of my social life, originally uploaded by Aubs. Lila Belle, my cherubic, creative, energetic and all-around lovely dog, has been acting out as of late. It’s no mystery why – if MY Mom left me alone the past 35 evenings IN A ROW to go corrupt her liver, I’d eat a DVD, too. And a box of razor blades. And a tube of toothpaste. And a bottle of suntan lotion. And an “In Style” magazine. 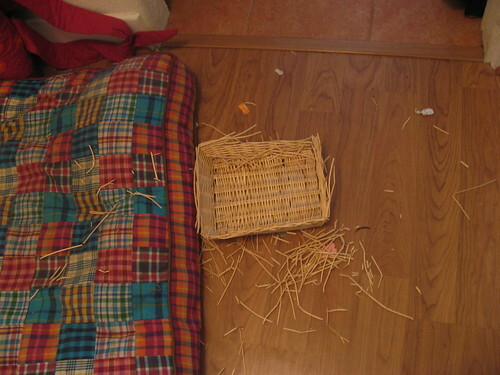 And, clearly, a wicker basket. …and ruin my streak? Naah.